Networking can be awfully tedious. Especially if you are in the wrong group. Networking on LinkedIn can be just as dull - you have to pick the right LinkedIn group to join. How do you pick the right group? Now, you could invite everyone who had just viewed your profile to connect with you. But, I don't recommend this. Even when you use this technique, you have to have a purpose or reason to invite someone to connect or join your network. Remember, the trick was that they were the "right" people because they were interested in you right now. So, how do you get into the right group? Simple, you invite the "right" people. Probably have something to say to them, don't you? And I am going to show you how to invite the "right" people to a LinkedIn group. Now, what Joe and I do is to invite our new 1st connections to 3 or 4 of the franchise groups we own or manage. For example, we would invite an New York attorney whose practice involved commercial transactions to the Franchise Attorney Group, the Finance Group, and to the New York Franchise Association Group. Joe and I can easily do this because we are owners/managers of these three groups, and many others. 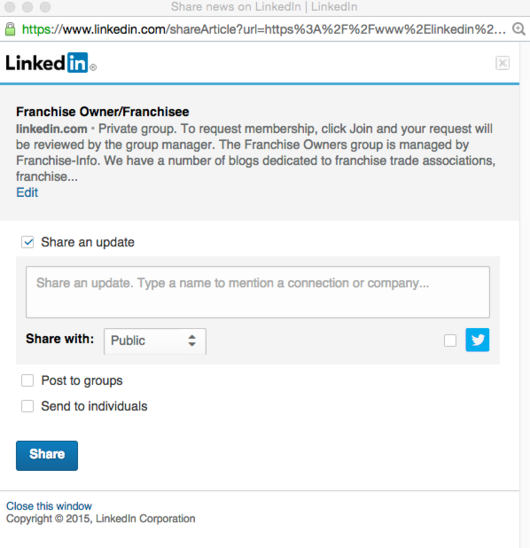 LinkedIn makes it easy for owners/managers to invite their connections to join a group. But, how can you do the same thing? When you are not a manager or owner? LinkedIn doesn't make it obvious anymore how you can invite your first connections to join the group or groups you are in. So, here is one way you can invite your first connections to your favorite group. 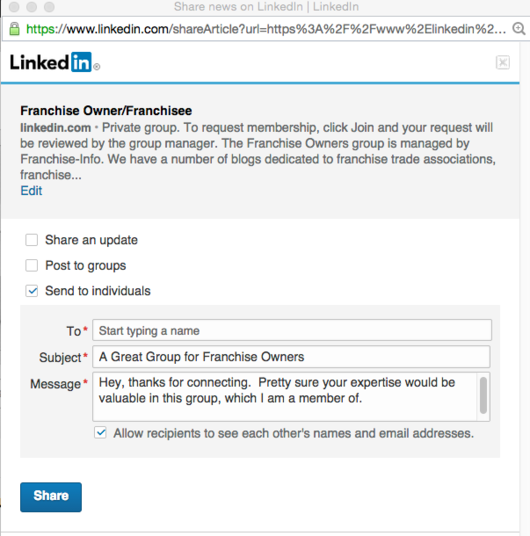 I am going to use the example of inviting a first connection to join the Franchise Owner/Franchisee Group. Step 1 - Go to the Group and Look in the Top Right Hand Corner. See the funny arrow? It's a share button. Now, make sure you are sharing from the front page, where the discussions are. Step 2. Click on the funny arrow and you will be presented with this box. Step 3. You can do several things at this stage. 1. If you click on the blue button, you will be asking everyone who is viewing your feed right now to join the Franchise Owner/Franchisee group. You could safely do that. b) check "Send to individuals", and then click on the blue share button. b) have a good reason for them to join the group. Don't go with the standard LinkedIn default, even if you are really pressed for time. Now, your group will be filled with the right sort of people. People who want to talk with you.